If you have heard of a low carb lifestyle, you may already be intrigued by the amazing results and seemingly easy methods of eating. It seems pretty straightforward- eat low carb, lose weight, feel good! Sounds like a diet that many people should look into. There are a multitude of reasons to pursue a low-carb lifestyle. Whether you are interested in the latest diet trends or simply trying to drop a few pounds, one thing is clear: cutting carbohydrates leads to cutting inches. This has been tried, tested and proven to be true time and time again. So why not just start cutting carbs immediately? It sounds easy enough, right? Why doesn’t everyone just cut carbs from their diet to live a healthier lifestyle? Unfortunately, giving up carbs is easier said than done. Everyone has that one dish, that one special treat, that single thing that that they love and cannot resist that is absolutely packed with carbs. Some people have more than one treat that they crave making it even harder to stop eating carbs. For some people, that thing may be something sweet like that big bowl of ice cream topped with whipped cream and sprinkles that just calls your name. For other people, they may crave bread in any form and just can’t go a day without it. However, for many people that delicacy they just need to have is crackers. There is something about crackers that are hard to resist. Most ave that delicious salty crunch that is satisfying and certainly crave worthy. 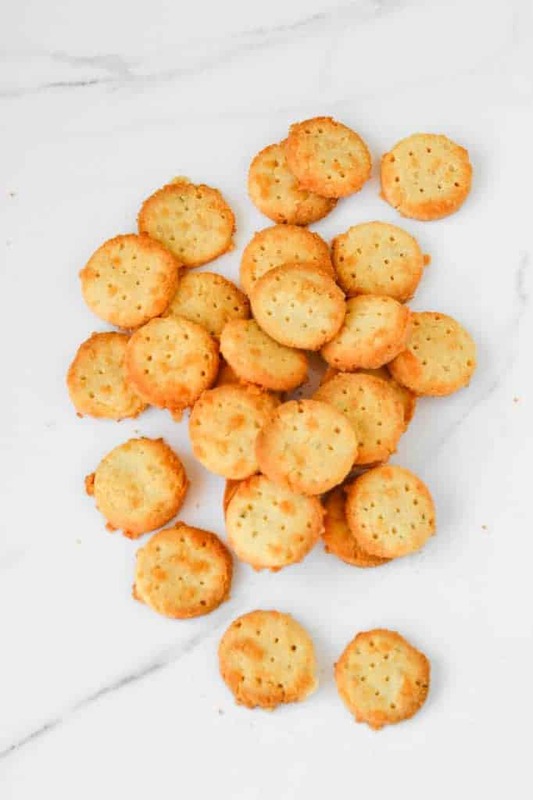 Other crackers have a subtle sweetness paired with the salty taste that makes them an all around perfect snack (who can resist a sweet and salty combination?!?). No matter which crackers you choose, they are just great. End of story. Many people also think that crackers are fairly healthy. They are often considered to be a healthy alternative to chips. People know that crackers are typically baked rather than fried and less greasy that many chips. Believing that crackers are healthy is a very common misconception. Crackers are one of those things you may not automatically think of when you consider cutting carbs from your diet. Yet, once you are consciously eating and counting the carbs you consume, there they are- the tons of carbs in your favorite treat. Those crackers are laden with unfortunate carbs. They will have to go! But what can you do now? When you have no crackers to satisfy your cravings yet you need to eat something. How can your meet that need on a low carb diet? What in the world can a cracker craver do?! Cutting out traditional crackers may mean that you may need to turn elsewhere for your salty, crunch snack but you will surely find that not much can compare. A low carb snack of a carrot stick won’t do. A low carb snack of fruit may be crunchy but it just doesn’t have that salty thing you need. You need a cracker and you need it now. So why not consider a low carb cracker? 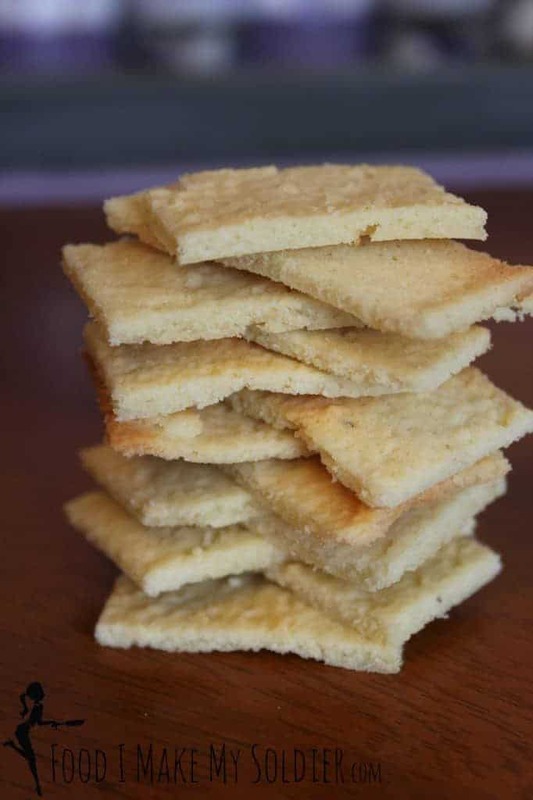 Thats right, a low carb cracker does exsit and, in fact, you are in luck because there are tons of low carb crackers that you can make! The day is saved- you can have crackers again AND stick to your diet! Hurray! 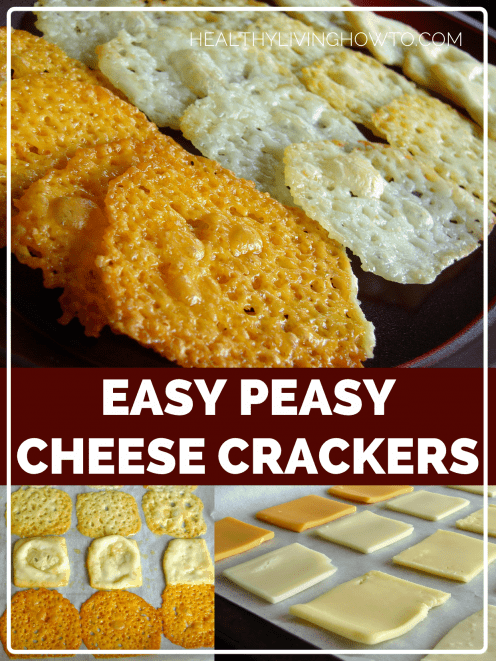 So, not only will you be able to have the snack that you crave but you can also make the crackers yourself and control every ingredient that goes into the cracker. This means you do not need to read that tiny print on a label to see what exactly you are ingesting (you can’t even pronounce half of those ingredients anyway…who wants to eat crazy chemicals?!?). If you are following a low carb cracker recipe and decide that you want to have a little more spice, ramp up the spices! If you are going along with your recipe and think that a touch of stevia will be a good idea, go for it! When you make your own snacks, you are in control. When thinking of making a low carb cracker, you may automatically think that they won’t taste very good. Let’s face it, there are many low carb products on the shelves that don’t taste good so it is understandable that you think this. However, you are wrong (and in this case, it is great to be wrong!). A low-carb or no carb crackers recipe does not have to mean that the final product is flavorless. In fact, many of these recipes are very flavorful while also being better for you than their grain-based, sugar loaded alternatives. These cracker recipes are full of spices and natural flavors that make them really stand out. There are recipes based on veggies that highlight the robust flavors of the veggies. There are crackers that are base around nuts and nut flours. Of course, these are extremely flavorful, delicious and rich. There are some crackers that are made with the best ingredient ever- cheese! So clearly, flavor is not an issue with these low carb cracker recipes. There is also truly something for everyone when it comes to looking for a great low carb cracker recipe. In fact, you are going to be amazed by how many options you have. Everything from cheesy to spicy, robust to a little sweet, there are almost too many choices! If you decided to make every cracker on this list, you would have crackers for days, for weeks, for months! 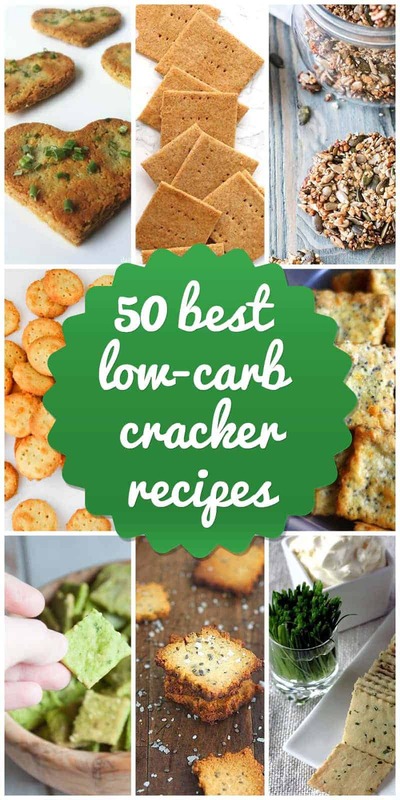 This list is going to keep you in low carb cracker heaven. In fact, there are more low carb cracker choices here than there are in the stores. There is no chance you will ever go into a typical grocery store and be able to have fifty different low carb cracker options. SO why even bother? Making your own just makes sense. Bring able to be in control of your diet is so rewarding and makes life just so much easier. Once again, we know how hard it is to diet and stick to the best foods for you so why make it more challenging. Don’t go to the grocery store and spend time reading every cracker label, just choose one of these awesome low carb options and get what you really need out of your cracker- no wasted time, diet friendly and so, so many choices. Pride. 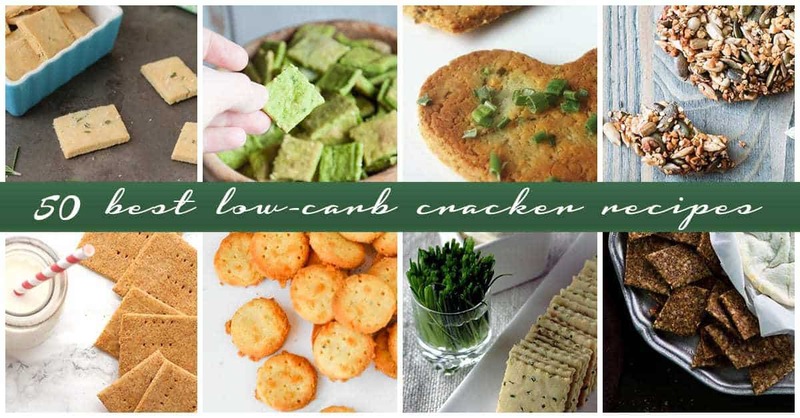 Making your own low carb cracker recipes are going to fill you with pride. Not only are you committing to sticking to your diet but you are making something healthy with your own two hands. When you are willing to put this much time and effort into your diet, you are guaranteed to succeed. When you succeed on your diet, what does that do? Fill you with pride! And you should be proud! Not many people are willing to hand make crackers in order to maintain their commitment to being healthy. It is a lot of work! But, just like ay diet plan, there is work involved. Diets are never easy. But what is great about a low carb cracker challenge is that it can actually be fun. If you enjoy cooking (and eating the tasty results) then making low carb crackers is right up to your asile. Mixing the dough, rolling and shaping the crackers, playing with spice combinations- it can all be exciting! Fun, low carb and doing something that makes you proud sounds like an ideal way to snack. Another thing to consider when looking into low carb cracker options is the fact that snacking is actually very beneficial to diets. It may seem a little counterintuitive but it is true. Eating snacks is a great way to stick to your diet. Why, you may ask? Because it gives your body just a tiny bit of what it craves to keep you full, satisfied and helps you avoid other, potentially detrimental snacks. By allowing yourself to have a snack in between meals, you are fulfilling your natural need for food. It is hard to go hours and hours without eating and not only will your stomach be empty and rumbling for something to eat, but mentally you will be craving something as well. When on a diet, it is natural to think about food frequently as you are focusing on what you are consuming more than usual. You are counting carbs, debating what is healthy and not healthy and trying to avoid things that you may normally enjoy. When you are thinking about food this much, you will be hungry and it is actually not healthy to ignore this natural response. If you choose not to eat, you may start obsessing about your cravings even more. You may also start binge eating when you finally allow yourself a meal which is terrible for any diet. Filling your stomach quickly with a lot of food makes it hard for your body to digest. So, instead of falling into the unhealthy pattern where you starve, binge eat and then starve again, why not just allow yourself that in between meal snack? When the snack is something that is allowed on your diet, it is actually quite good for you to have. Snacking will give you just enough food to get from one meal to another and also give you a diverse range of nutrition. 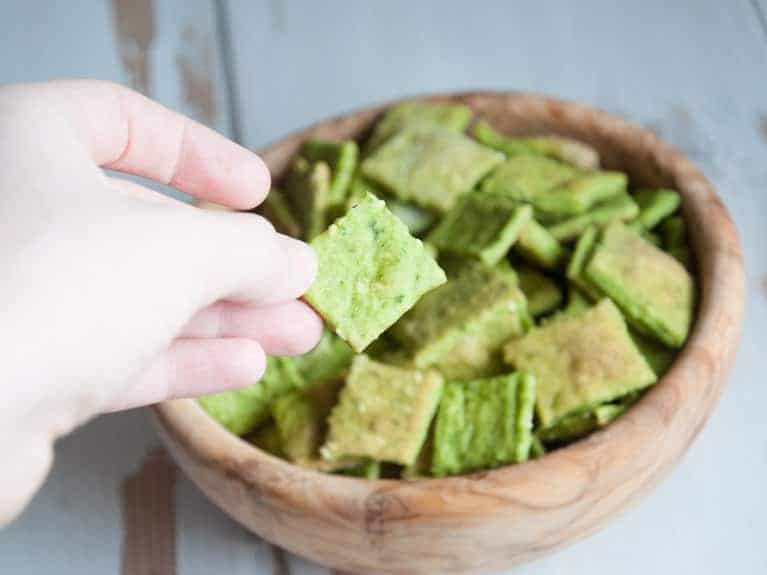 Grabbing a bunch of low carb spinach crackers will give your a few bonus veggies while also keeping you full and meeting your mental need to eat. Sounds like a total win! As long as you snack intelligently and consciously (you don’t want to just reach for anything that may be in front of you but really consider your snacks and analyze if they are allowed on your diet), you can see why snacking is a good thing. It prevents you from overeating later in the day, gives you a much needed mid day boost and also supplies you with a little bit of extra nutrition you may need to round out your diet. Snacks are a must. Therefore, low carb crackers are a must. There are just so many reasons to start making these recipes right now! So what you are getting with any of these recipes is a tasty, healthy, craving satisfying cracker? Absolutely! Why ever even think about the old “normal” crackers you use to eat when now you have these! The options, the guarantee that they follow your diet requirements and all the flavors you could possibly need- is there really a question?! You know this is the way to go! While a low carb diet may be new, as you can see, it doesn’t have to mean the end of all the delicious foods that you love. In fact, it really means the beginning of discovering new foods that are healthy and delicious. There are so many amazing low carb recipes that you will be able to make and you will never have to struggle to find flavor. Many people who start eating low carb to diet or lose weight end up just loving all the new foods they try. Even if you move away from a low carb diet later in life, you are surely going to take some of the great new recipes you discover along your journey. Eating healthy is always in style! A low carb diet is a lifestyle change that you will love. 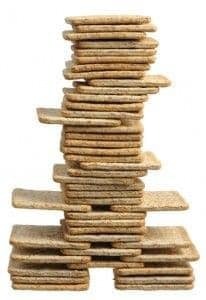 And guess what, feel free to munch away on as many of these crackers as you’d like! 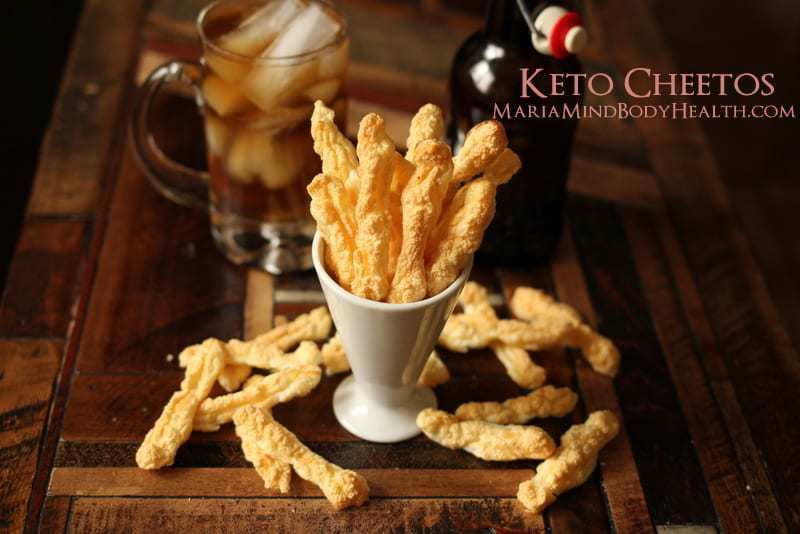 These delicious low-carb snack utilizes almond flour to make a cracker that is both delicious and fits within most low carb diets. Unlike normal wheat flour, almond flour is safe for people with gluten sensitivities and adds a delicious nutty flavor to recipes. Almonds have also shown to be good for skin and hair. These bite size treats only require a few other ingredients and bake relatively quickly. They are a wonderful substitute for those who love sour cream and onion potato chips! On the spectrum of healthy snacks, this is definitely a personal favorite. In place of grain, this delicious delicacy uses sunflower seeds and chai seeds. 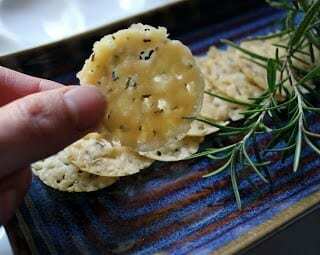 The parmesan cheese and rosemary give them the extra bit the flavor that make it taste like a high-class snack. You can even try making them with different seeds to suit your taste! Add a bit of your favorite spread, and it will quickly become a welcome addition to any low-carb diet! With an astonishingly low 1.6 carbs per 6 crackers, these butter crackers are a delightful low-carb cracker recipe. And the best part about it? They are extremely simple to make and taste like delicious, melty butter. It is possible to prepare the ingredients, bake the cracker, and be enjoying a dainty snack in under 30 minutes. These crackers also contain stevia for lower calorie sugar alternative. As such, their crackers get a gold medal in the category of healthful snacks! Again utilizing the benefits of almond flour, this is a very basic version of the cracker. Flavored with onion powder and garlic, this recipe makes a wonderful addition to soup or paired with a tasty cheese. Containing only a few ingredients, this recipe is also pretty simple to prepare. Many also like to serve this cracker warm- how innovative! 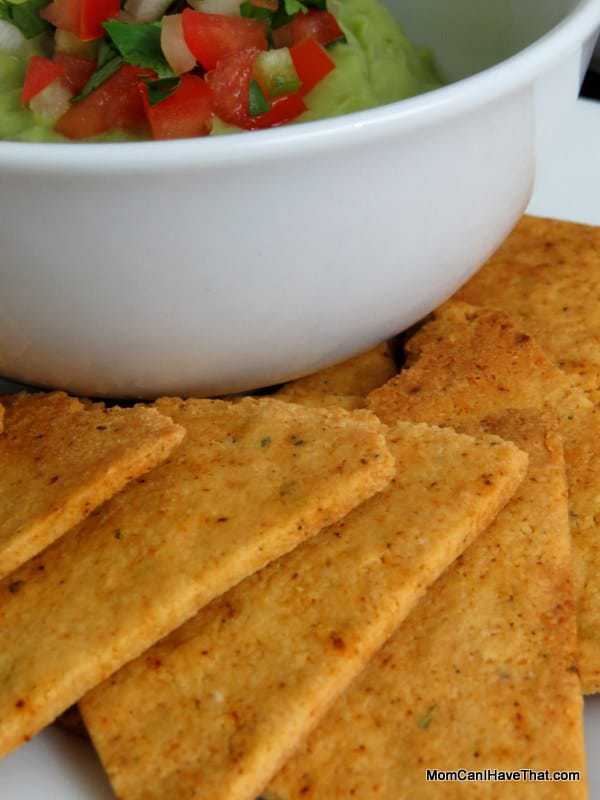 The crunch from this thin cracker adds a fulfilling bit of texture to any meal! 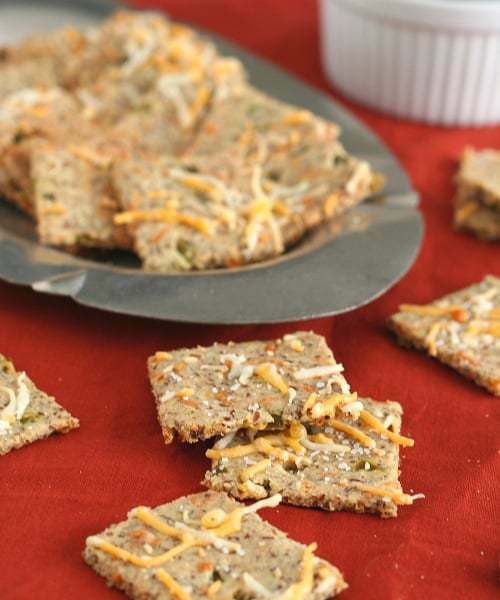 Spicy and flavorful, this is one of the few virtually carb-free cracker recipes. Amazingly, it utilizes cheese and jalapeños as main ingredients. Because there are only two ingredients, the cost of this treat is extremely low as well. How does one make cheese into a crispy snack? Simply bake for about 10 minutes! This feels like a secret that has been hiding in plain sight all along. How did we not know about crispy cheese crackers until now?! The creator of this recipe recommends serving these with a homemade ranch dressing. They would also be a wonderful addition to salsa! 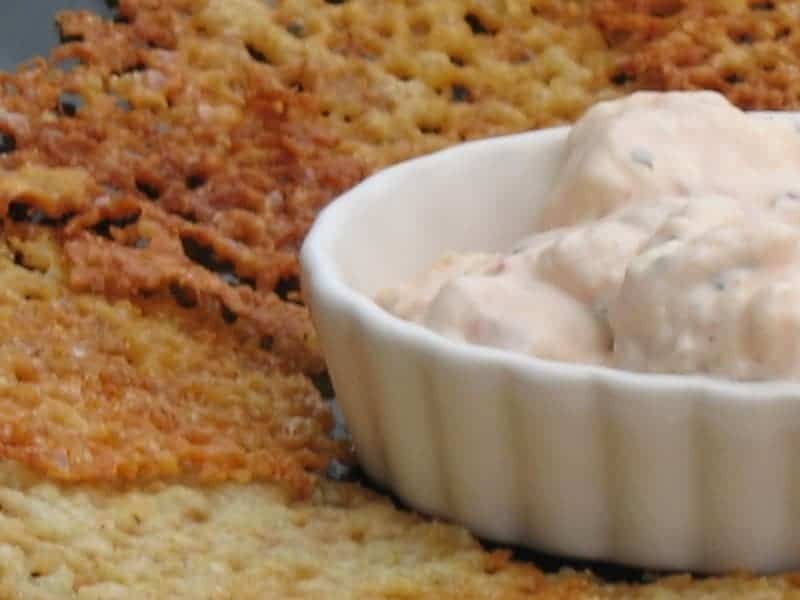 This low-carb cracker recipe has become popular in the internet world. The dough itself uses almond flour, cheese, etc. that many of the other crackers use. The difference is all in the way that this cracker can be seasoned. Taco seasoning, basil, lemon and rosemary, parsley, and chili are all recommendations that make this one of the most versatile recipes available! What will you choose to put in your cracker? 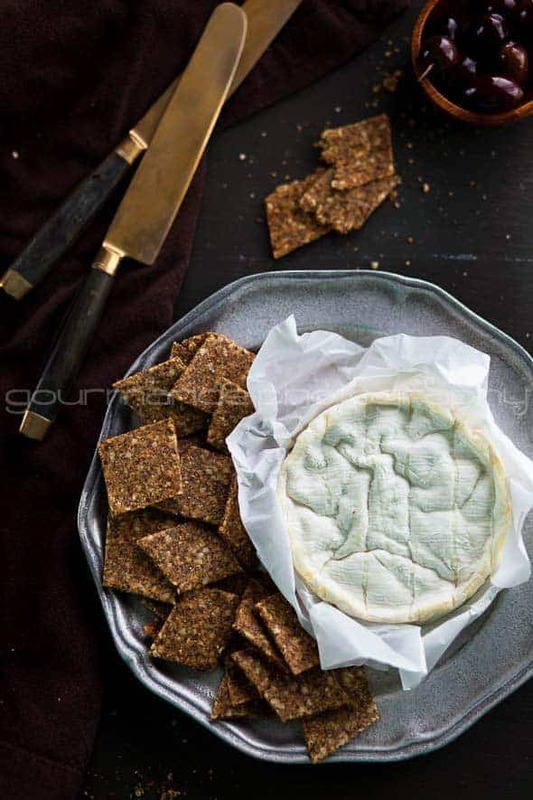 Exquisitely crispy, this is a new take on the almond flour cracker that uses arrowroot flour and oat starch to keep the crackers fresh for longer. 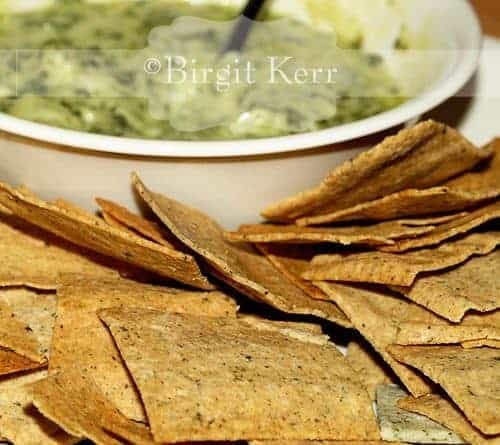 Since this recipe makes more than 90 crackers, you will want them to keep for a while! 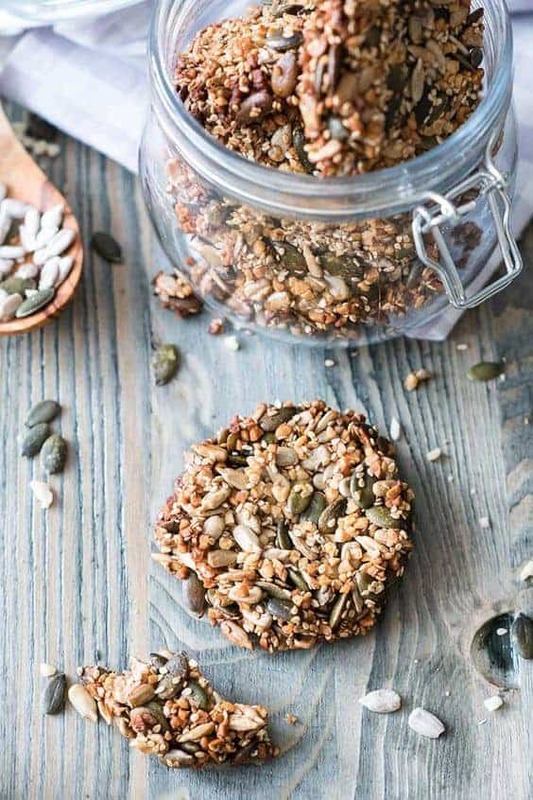 This recipe also uses flaxseed which has been shown to have a great many health benefits! Healthy and low carb- these crackers are a total win. 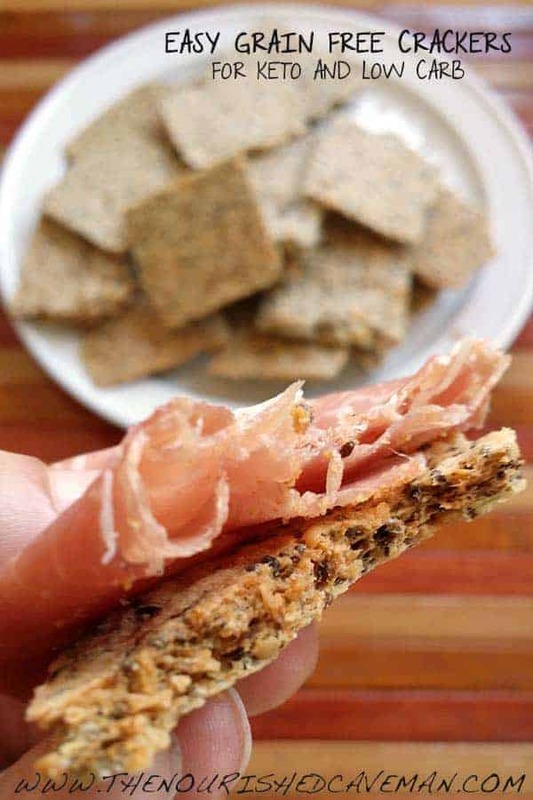 This combination of low-carb foods as ingredients make this a cracker to write home about! 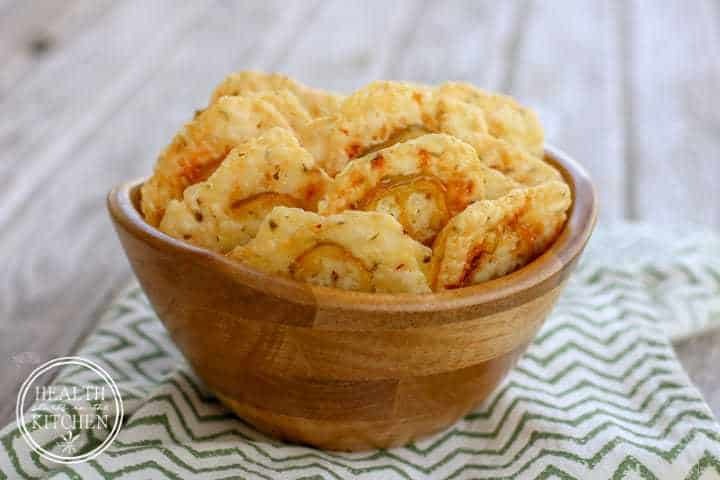 Like the jalapeño crackers, these crackers are simply crispy bites of cheese! And who doesn’t like cheese? This is probably the closest to a no carb crackers recipe that can be achieved. Although the nutritional specifics depend on the type of cheese being used, most cheeses contain a very minimum number of carbs. Consider using different cheeses for different purposes! Swiss cheese would be great with a meat dip! Mozzarella would be tasty with tomato sauce! The possibilities are endless! Just be careful with these beauties as they are fragile! If fancy low-carb crackers are what you seek, this is the snack for you! Instead of almond flour, this recipe uses freshly ground almonds along with cheddar and parmesan cheese and various herbs and spices. What makes this recipe different, however, is the addition of coconut flour. This allows for a texture that is a little bit fluffier than crisp and a nice subtle tropical flavor. For a better analogy, they are more like a Ritz cracker and less like a Wheat Thin. 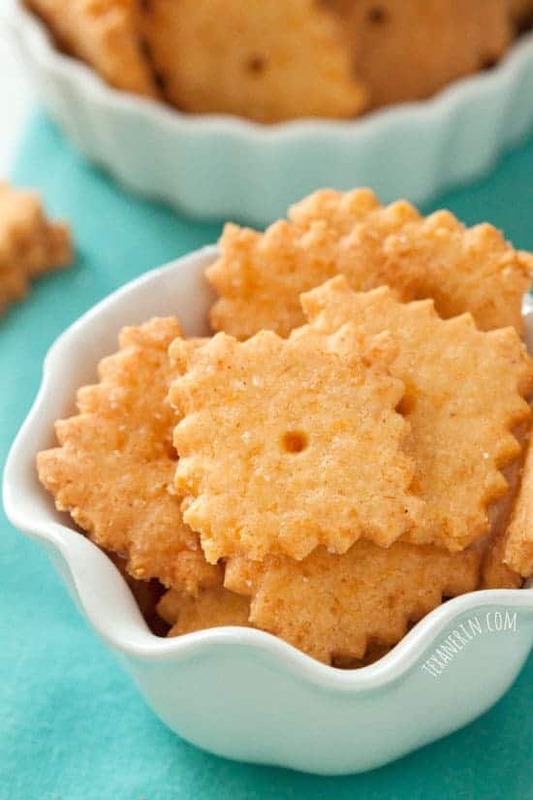 This mouthwatering cracker is nearly addicting- who doesn’t like a ritz cracker after all! Sunflower seeds are great just on their own. But what happens when you put them into a low-carb cracker recipe? Tastiness ensues! In addition to their delectable goodness, these crackers have almost 8 grams of protein and twice as much fiber as store brand cracker! Add these to a homemade spinach and artichoke dip for even more healthy goodness! You will never go back to eating store bought crackers again. Many recipes use cheese to make their low-carb foods more flavorful. Most, however, do not use cottage cheese! This low-carb and also low-calorie addition make this cracker unique. Cottage cheese also serves to keep this cracker a little bit more moist than some other versions. This is also why this cracker doesn’t have the shelf life of some other treats and need to be eaten quickly. However, it will definitely not be hard to finish these heavenly appetizers in a timely manner! 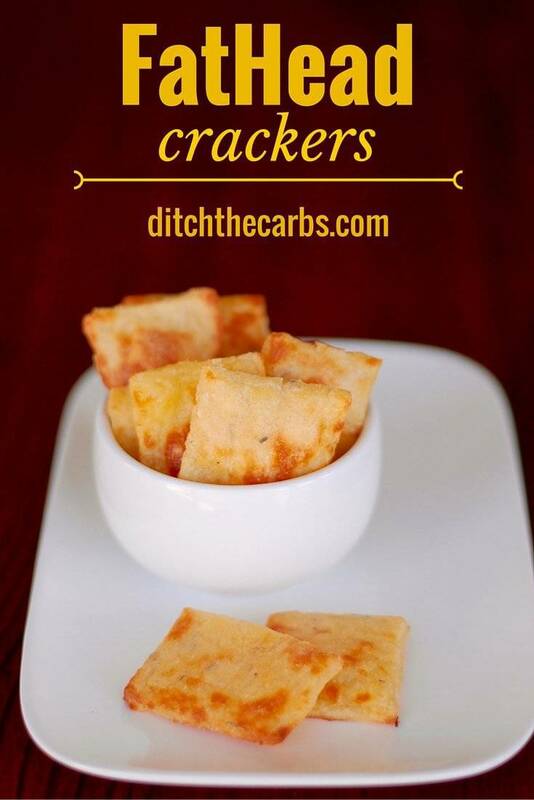 Finally a low-carb crackers recipe that soothes that sweet tooth! This almond flour cracker is sweetened with vanilla extract, coconut oil, cinnamon, and molasses. Because of the nature of this cracker, it could almost be called a cookie! This makes a great dessert treat to have with that evening cup of coffee! They are also a great addition to flavor up your plain Greek yogurt! You also definitely need to try it with some low carb chocolate as an extra special treat. One of the downsides of committing to a diet low in carbs is that you give up all of the healthful benefits of whole grains. Or do you? This low-carb crackers recipe uses whey protein for a delicious way to deliver such benefits without all of the carbs! What a perfect way to make your cracker taste good and be healthy. 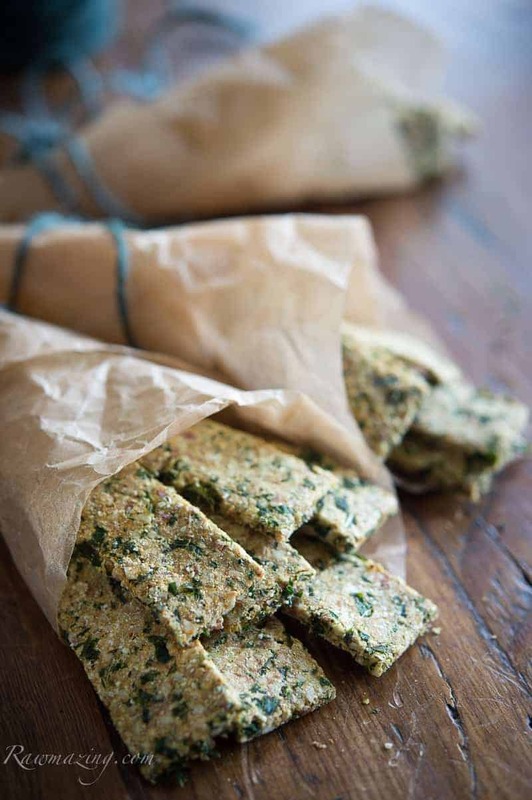 This recipe also contains 1.3-2.7 grams of protein PER CRACKER! Yes you read the title correctly! This healthier version of the popular snack contains 46 calories per serving. Compare that to the 150 calories in the store-bought version, and this tasty alternative will have you licking your fingers for more. In addition to being a low-calorie crackers recipe, they are very nearly a carb-free crackers recipe. What is inside these amazing little snacks? You’ll have to check the recipe to find out the secret. 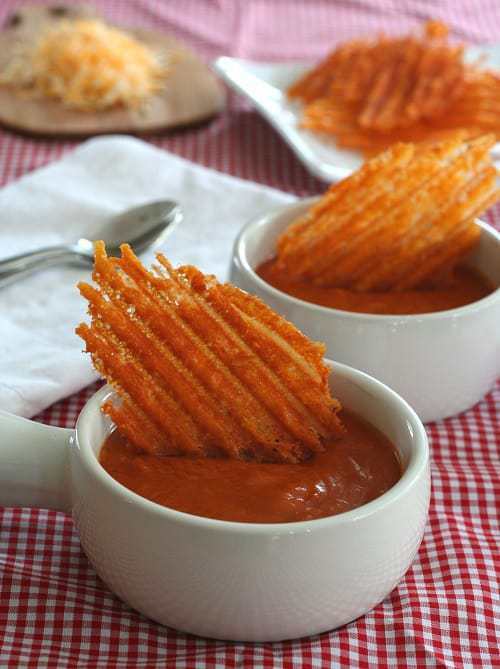 This simple creation is a great for those who love wavy chips. These tasty crisps are cooked inside a Panini press to give them the wave and crunch that such a snack must have! A waffle press could also be used for a texture variation. Flavored with Tabasco sauce, these crisps are made entirely from cheese. 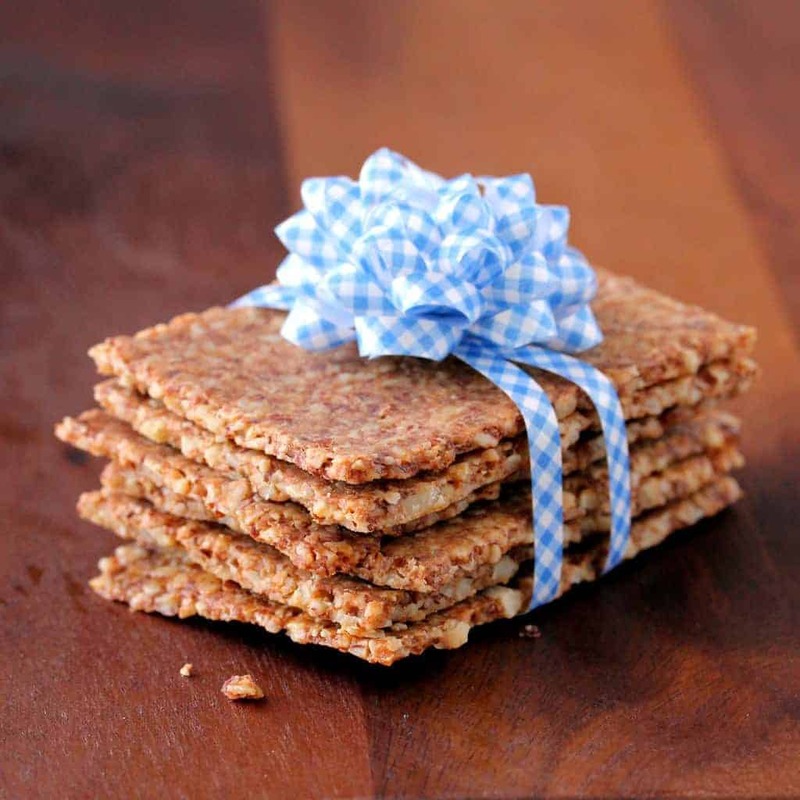 Since this carb free crackers recipe is so simple, it is a great idea for parties and special occasions! Everyone will wonder how you made these perfect wavy, low carb chips. For those who are picky about texture, this is definitely a cracker for you. 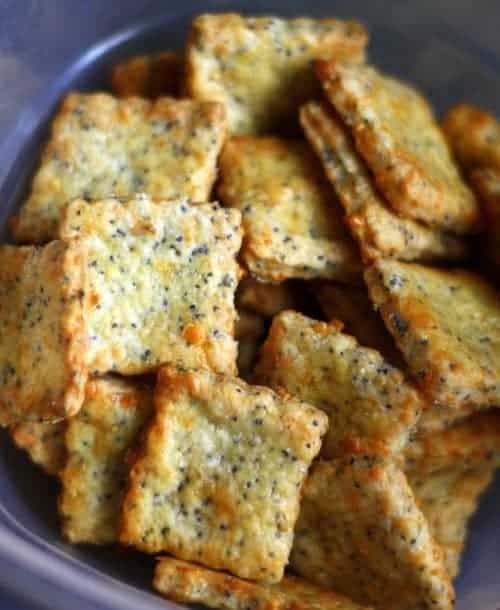 Again using almond meal and chia seeds, this savory snack is a close comparison with a Cheez-It. The nice smooth texture is what will win you with the first bite. As such, the versatility of this snack make it a great snack to take to work. No need for dips or flavorings! This cracker can stand on its own! This recipe is also a healthy addition to a child’s lunch box! The next low-carb cracker recipe is packed with “good” fats! Flax seeds have been proven to contain Omega-3 Fatty Acids that actually help to increase cognitive brain functions such as concentration and memory. Hemp seeds contain essential Amino Acids which are considered to be a building block of good health. 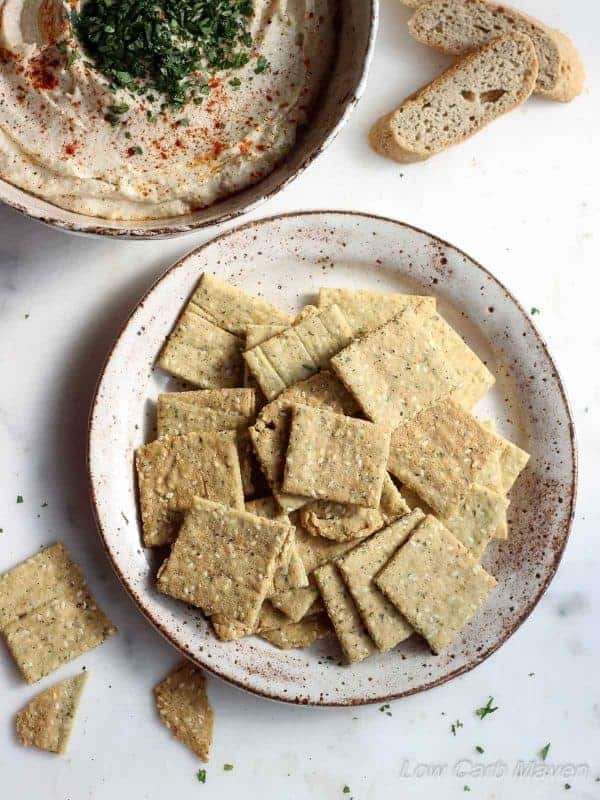 Described as a bit “nutty,” these crackers are tiny snacks that pack a good nutritional punch with a whole lot of flavor. Animal crackers are a part of everyone’s childhood! No one can forget reaching into the box to pull out a roaring lion, a ferocious tiger, or a majestic elephant! These sweet snacks will also make you want to roar will delight! 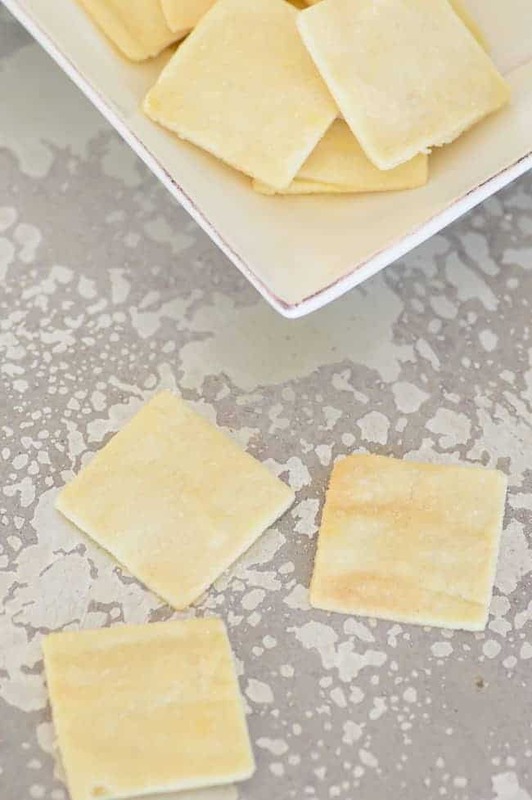 With just a subtle hint of vanilla, these crackers will have you nostalgic for old days and eager to share the healthier low-carb recipe with your own family. 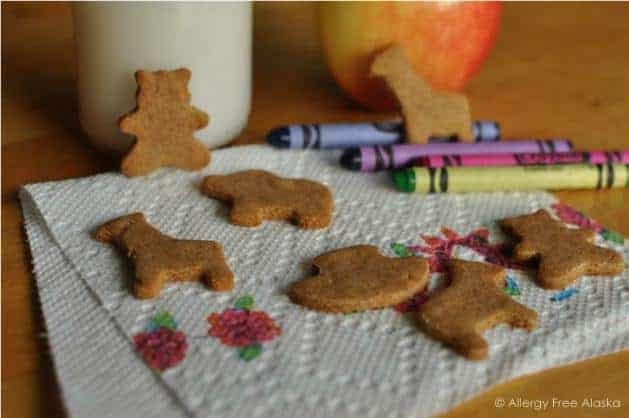 Your kids memories will be not only of eating animal crackers but making them too! It is hard to get enough vegetables in your diet. This is one of the low-carb crackers that can help with exactly that! Offering health benefits of vitamins A and K, kale has been a popular asset to the health food scene for some time. This, however, is a much more fun way to eat kale than any salad and you still get all the healthy kale benefits. Flavored with paprika and chipotle, you may even convince the whole family to partake in this little bite of goodness! Low-carb crackers do not have to be fancy to be delicious! This cracker is a bit more simple. Utilizing almond flour once again, this treat is a perfect dipping crisp. 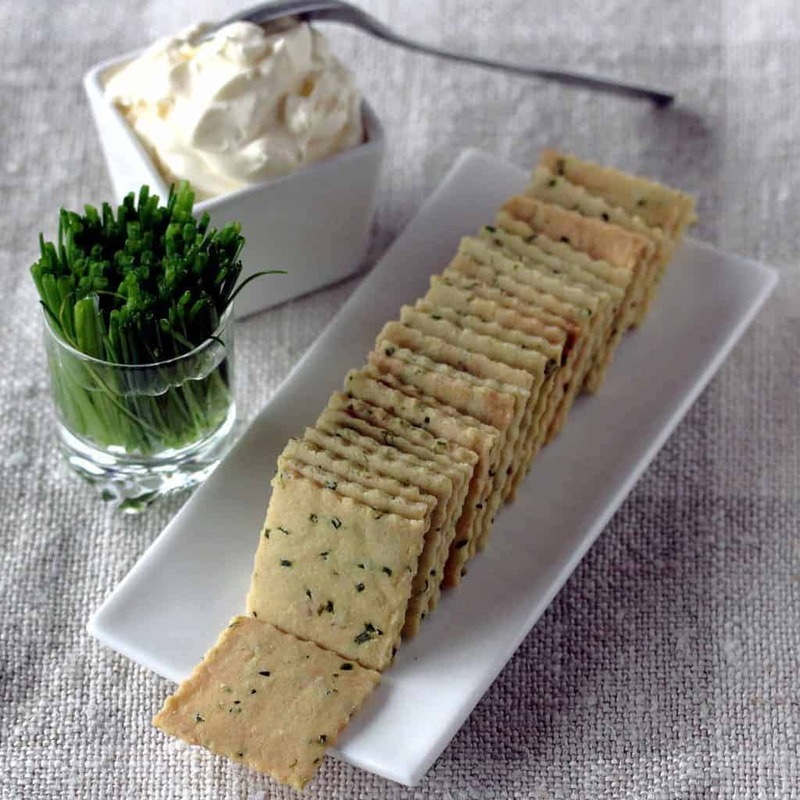 Because of the simplicity of the taste, this is a great cracker to serve with extremely flavorful dips. However, they are also perfect for snacking on when you just need a small something to hold you over. Try with a curry sip or Cajun styles of spread! Keeping the carb count to a minimum also helps you to feel less guilty about adding that extra bit of flavor! Rosemary is a tiny herb with a lot of health potential! From cancer prevention to improved memory to help with migraines and hair growth and liver detox, it is not hard to see why rosemary is a welcome addition to this cracker. 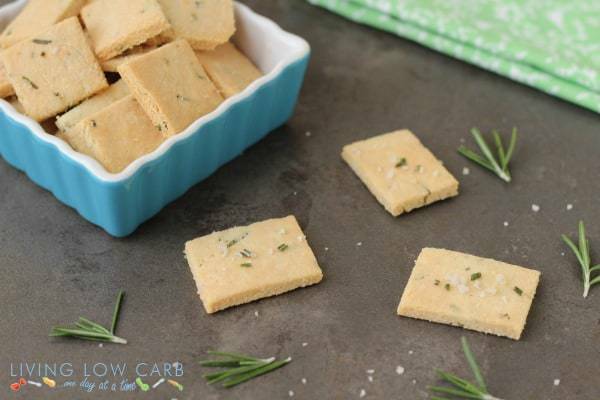 With the almond flour and egg base and the addition of Celtic sea salt and coconut oil, this low-carb cracker recipe is go-to for many low-carb food enthusiasts! Subtle flavors and simplicity is why you should try this today. Almond flour is something that should be a staple in every low-carb kitchen. This versatile “grain” can be dressed up in various ways! 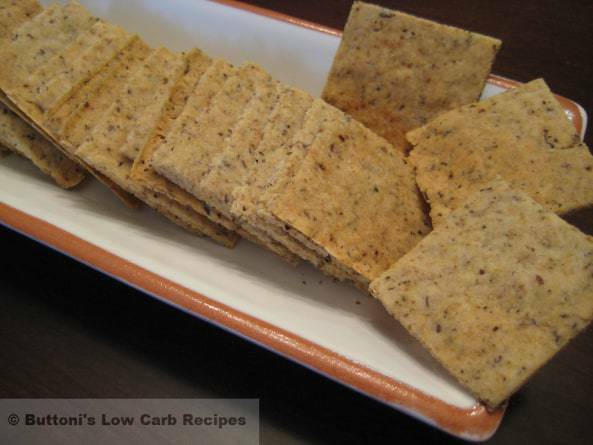 A favorite take on the traditional low-carb crackers recipe is to use sesame seeds instead. Sesame seeds are high in protein and fiber and are a delicious and well-textured addition to this snack! Try with a bacon dip or horseradish dip or just munch them on their own. 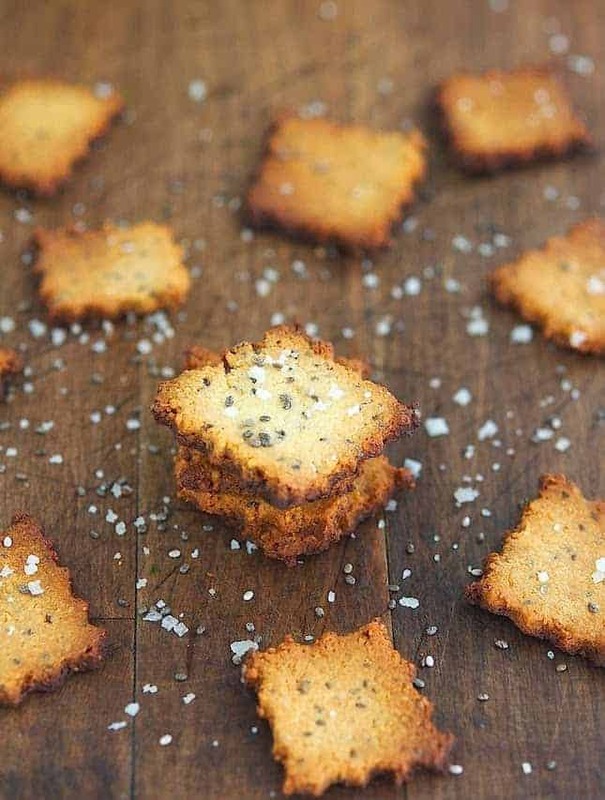 This cracker takes the traditional low-carb crackers recipe and alters an essential component! Instead of almond flour, this recipe uses cashew flour. Now the almond versus cashew debate is one as old as any health food. Both have nutrients that are great for the body. While almonds are wonderful sources of vitamin E and calcium, cashews have vitamin K and zinc to help with various aspects of health! Consider adding both flours to your cupboard. 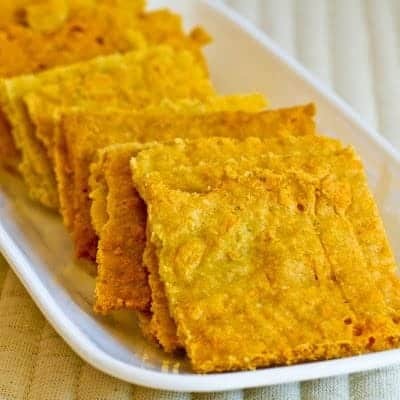 These crackers add spices and egg to cashew flour to make a tasty snack that you just cannot stop eating! That nutty flavor certainly shines through. Part of the fun of baking is the fun of sharing the experience with family. These crackers started as an attempt to make homemade goldfish. However, it was quickly discovered that they can be made into almost any shape hence the cheese-it looking version seen here. Mixing the low-carb foods that make savory crackers, this is a recipe that is both fun and mouth watering! The crackers are also great snacks for kids to enjoy as well. While there are many low-carb options for crackers, it is rare to find carb-free cracker recipes. This one is a favorite for that! Mozzarella cheese and Parmesan cheese combined with your favorite minced vegetable make this a delectable yet extremely healthful selection. There are various options for minced vegetables, but green and red peppers are definitely a favorite! Onions can also add a great flavor! What additions can you think of? This is a recipe that allows for some flavorful creativity! 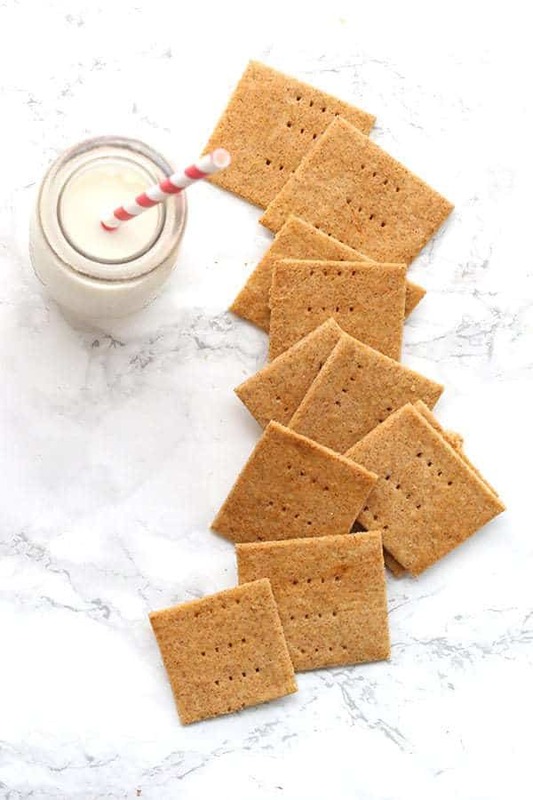 Graham crackers are a sweet treat that doesn’t have to be unhealthy. These little bites of sweetness are flavored with Swerve sweetener and molasses making it perfect for diabetics who also love this recipe because it is just the right amount of sweetness to raise blood sugar a bit. This low-carb cracker recipe is also great to use for pie crusts and toppings! Try topped with a Greek yogurt dip and fruit to add even more flavor to the snack! Let’s take a pause from crackers to look at another great addition to a low-carb diet! These breadsticks use almond and coconut flour with added basil, parsley, oregano, and olive oil to create and Italian side without all the carbs! Topped with olive oil and garlic or cheese, these make a great side to chicken parmesan or a soup! Or, they are just as delightful dipped in marinara sauce for a snack! Slather some butter on for a delicious treat as well. 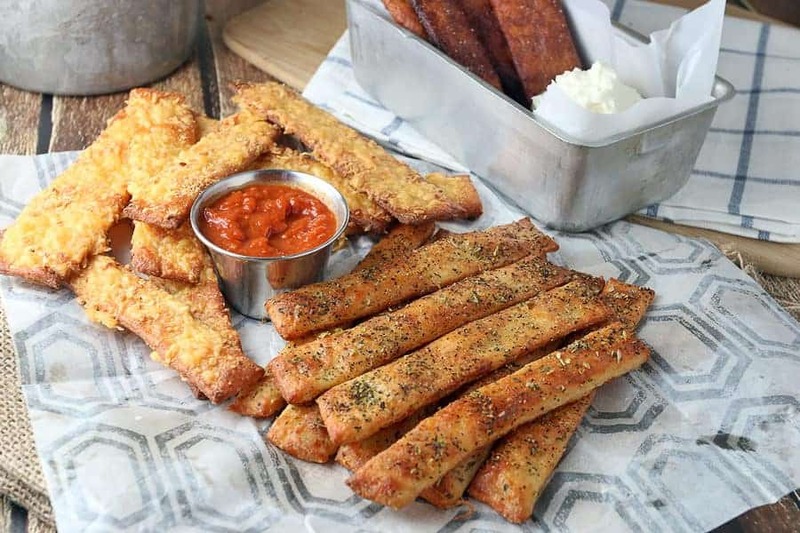 These breadsticks are a wonderful way to remind yourself that no carbs does not mean no flavor! The Ketogenic Diet is a new and trendy health craze. This cracker was originally made for the Keto Diet, but it also works well as a low-carb crackers recipe. Chai seeds and hemp hearts give this cracker a bit of a nutty taste and makes them a great addition to peanut butter, almond butter, or cashew butter! This particular cracker also goes well with meat toppings such as prosciutto or hot beef and cheese dip! This variation on other almond flour and flax seed recipes operates under the belief that less is more. The original creator of the recipe believes that too many spices and seasoning ruin a cracker. So this low-carb cracker uses a minimum amount of extras. This allows the taste of the black pepper taste to really shine through! This cracker is also a wonderful source of potassium! These crackers may look like something out of a Dr. Seuss novel, but they are a classy addition to your cracker repertoire. In addition to being low in carbs, this recipe also doubles as a low calorie crackers recipe and a serving of veggies! While the spinach pumps up the nutrient level, the flavor makes it a good choice for guacamole or cheese dip. The texture can also be made to be thin and crispy or thinker and more bread-like! Not everyone has time to prepare, roll out, and bake dough every time they want a cracker. The amazing part of this recipe is that it can be prepared in the microwave! How much easier can it get? Because these crisps are made of cheese, they are also one of those rare carb-free cracker recipes. Great for on the go, these tiny crisps will be a favorite for any occasion! Best part- you can make them in a matter of seconds. A personal favorite chip is Tostino’s Hint of Lime tortilla chips. These are a substitution that is well worth the time. The main flavoring in these low-carb crackers is Mrs. Dash Salt Free Fiesta Lime Flavoring- something you need to try right now! Along with other low-carb ingredients, this chip makes a great snack or side dish for a Mexican fiesta! Try with salsa! Your taste buds will thank you for this one! 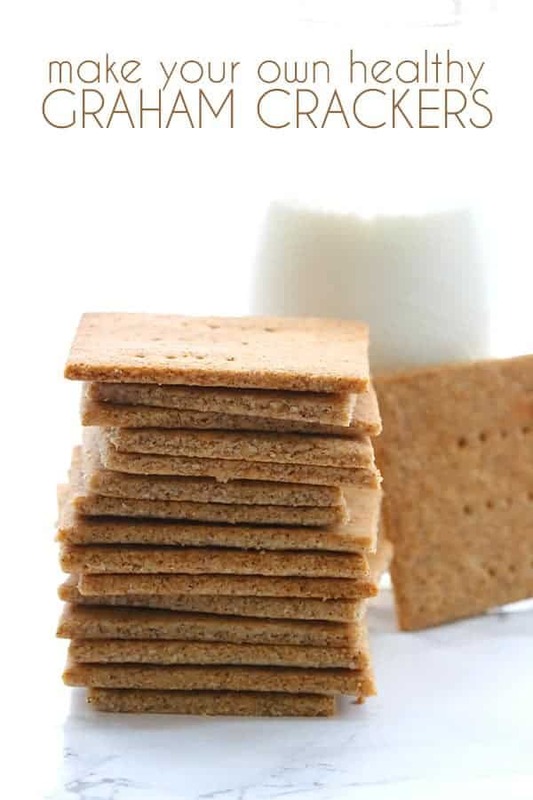 It is hard to find a sweet low calorie crackers recipe. This one takes the cake (or the cracker!) This sweet treat is a lot like a graham cracker! 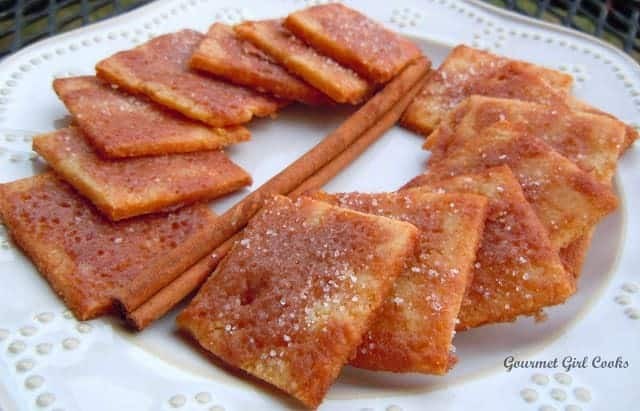 Topped with a cinnamon and butter mixture, this cracker is a dessert all by itself! Dip in frozen or low fat yogurt to add a fun summer spin! Eat it as a cookie or use as a crust for a pie! Never before have such simple ingredients had such a great taste! Mexican food is a family favorite! The best part about this dinner choice is that it can be topped with many different types of fresh vegetables. 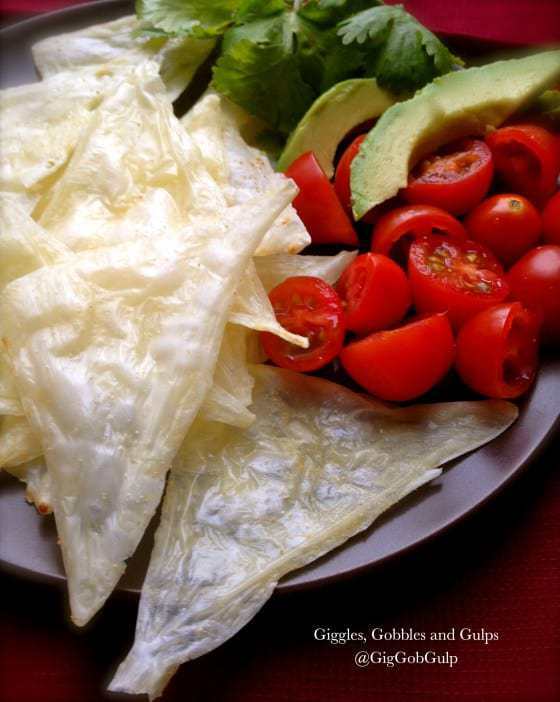 In the world of low-carb foods, this tortilla recipe is a must-have! It is versatile and delicious. 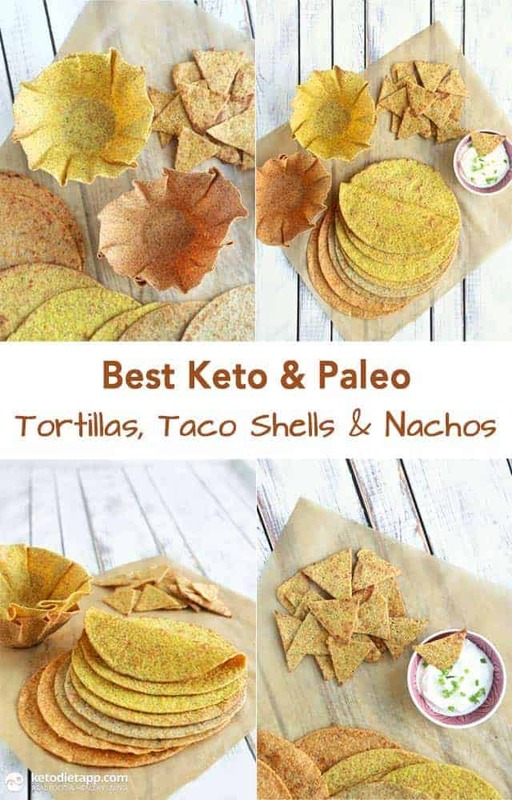 Utilizing flaxseed, coconut flour, and psyllium husks, this tortilla is a versatile low-carb option that also doubles as a recipe for nachos! Although this is not a no carb crackers recipe, the carbs in this cracker are nearly all the “good” carbs. 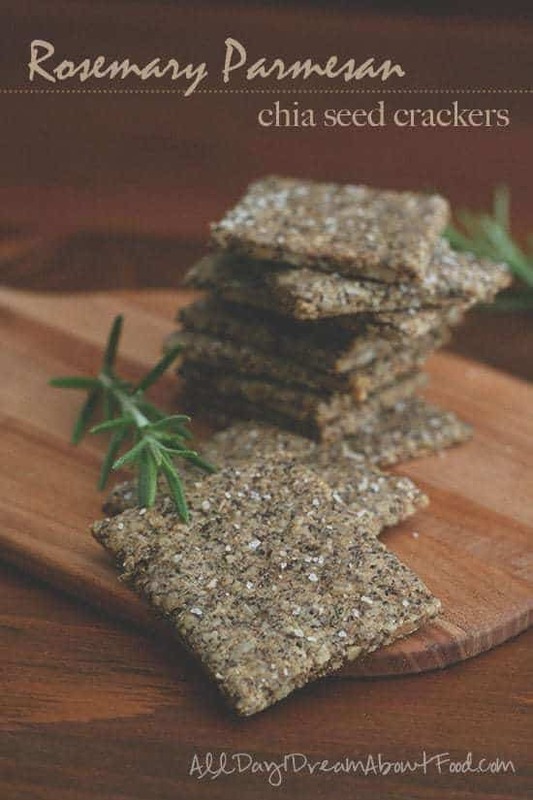 High in fiber, this cracker uses poppy seeds to make the snack a bit more wholesome. Additionally, this cracker does use some butter to flavor. Therefore, this is a cracker to eat in small portions (savor every bite!). However, these are great to take along during active days outdoors or at work! Okay maybe this one is not really a cracker. But who doesn’t like toffee? They are both crunchy right? 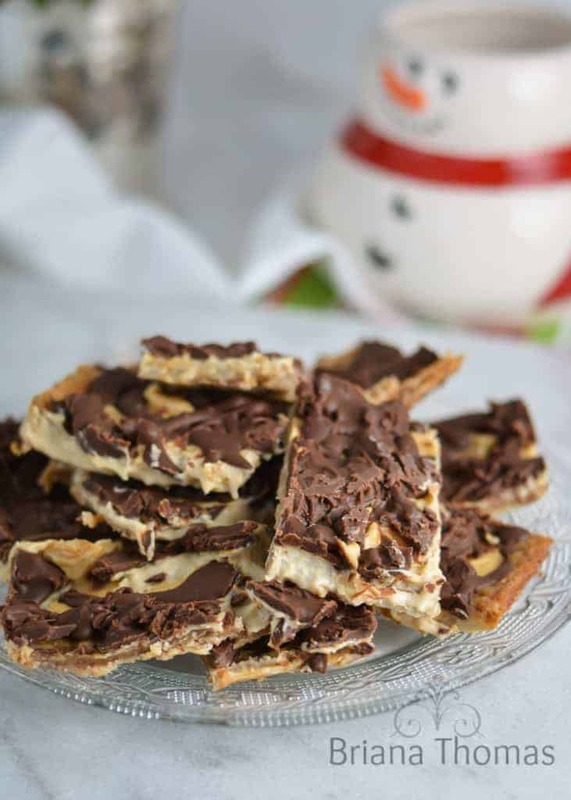 This holiday favorite is just as good as the normal homemade toffee. This recipe, however, uses some low-carb foods as substitutes for the more dangerous ingredients in toffee. Substituting sweetener for sugar, this dessert still manages to maintain an appropriate toffee texture- its amazing! This version of holiday cheer will be around for many generations! Avocado is a wonderful snack to have in the house! Packed with B vitamins and Omega-3’s avocado helps brain function and memory. In spite of it being a “power food,” however, avocado often turns people off due to the texture and color. This crisp is one of the great ways to sneak some nutrition into your snack. This low calorie crackers recipe is great with a variety of toppings, but it also has a delicious flavor by itself! Dip the avocado chip in guacamole for a bonus avocado taste! 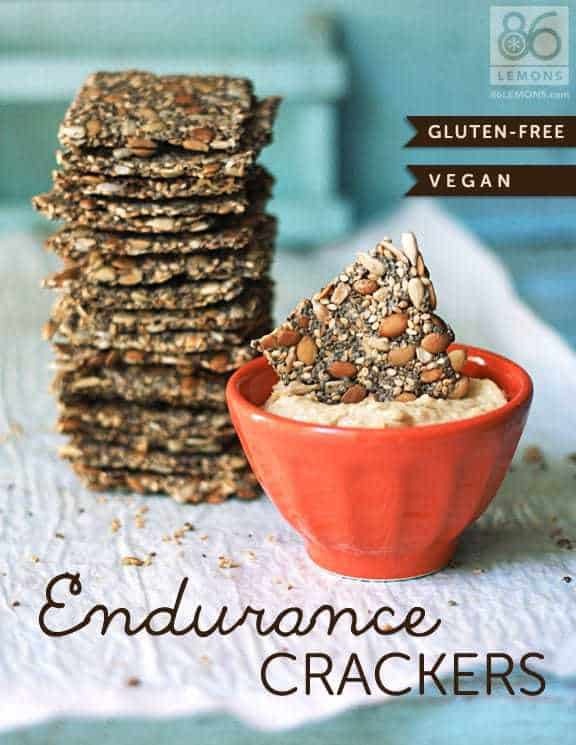 This carb-free crackers recipe is as simple as it gets! Simply toss some Swiss cheese on a pan and bake! you’re done! It really is that eas. 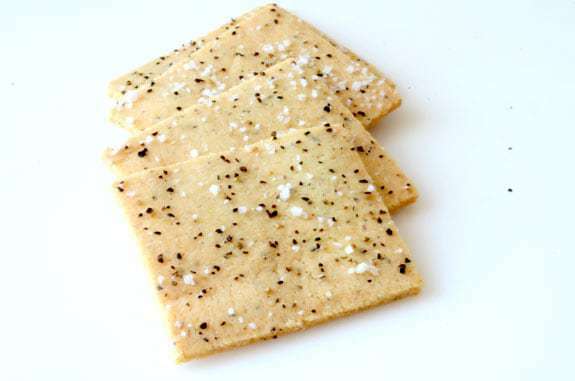 Adding a bit of garlic and salt helps to maintain cracker-like taste. These are a wonderful snack for children because they are inexpensive and packed with protein. They are also a great snack for moms on the go for exactly the same reason! No dips are needed to decorat and the cracker may not actually hold up under the weight of a topping. Simply pour these delightful snacks into a bag and munch! 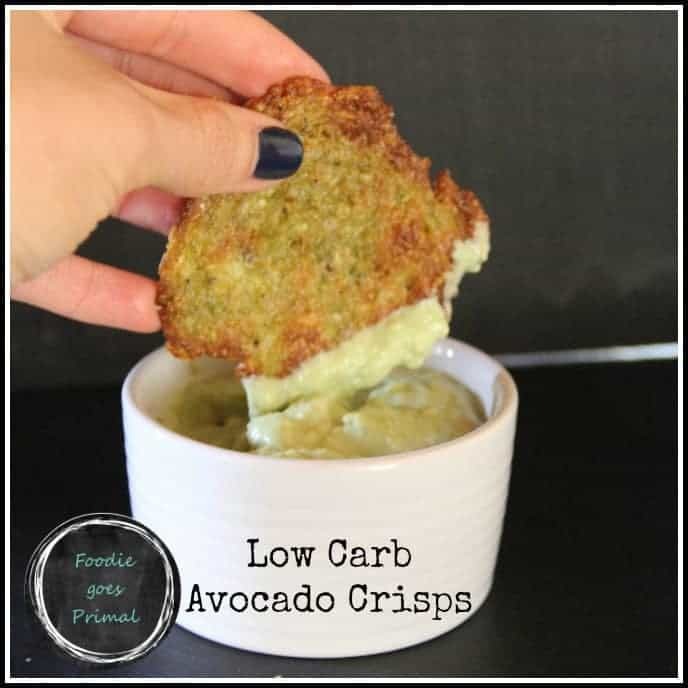 This cracker is another example of how a low-carb diet does not necessarily mean that you have to give up the foods you love! 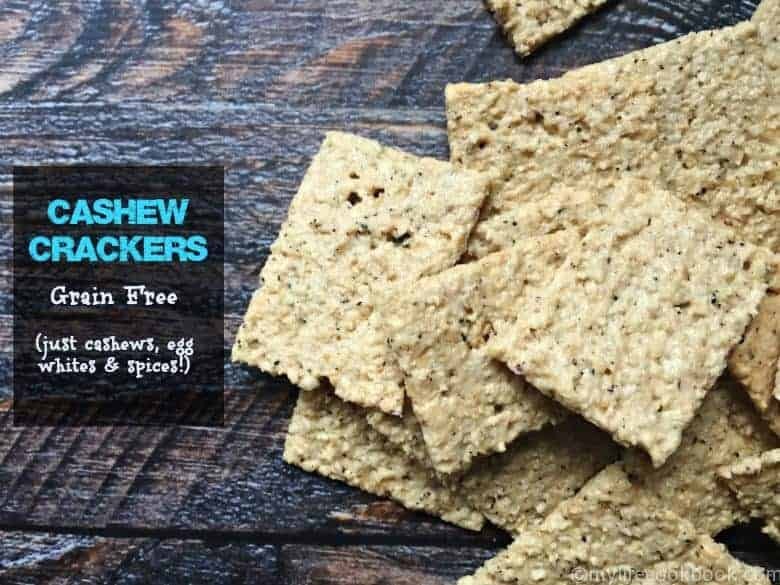 This simple carb free crackers recipe uses only two ingredients! Dip in marinara sauce for some added pizza flavor! 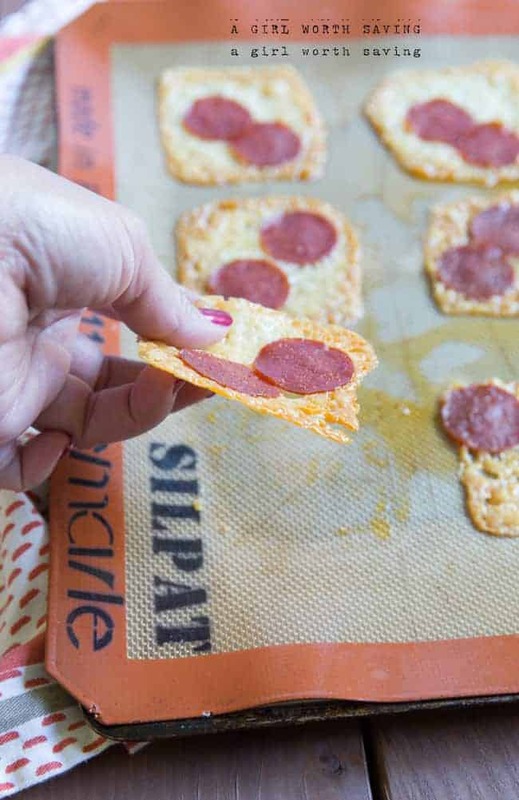 Or try some other pizza toppings baked into the crisp! Enjoy yourself without feeling guilty with this delicious treat. Who knew you could still eat the best part of pizza while on a low carb diet. 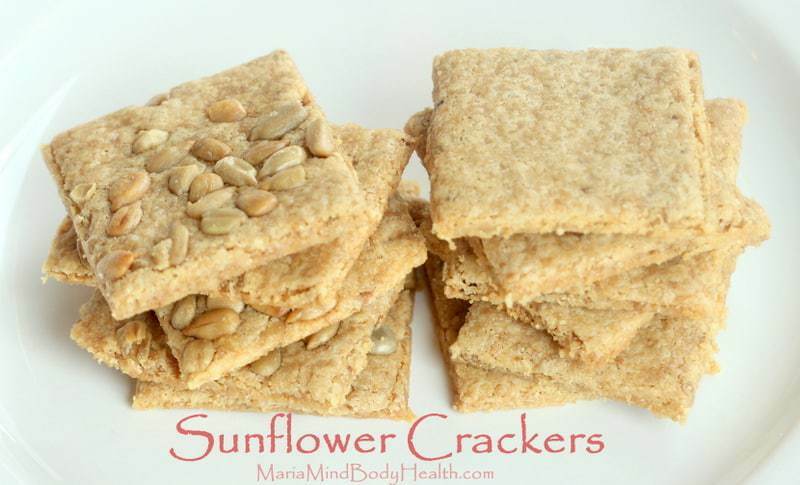 This is another one of those low-carb crackers that allows you to get creative! This recipe calls for any mixture of nuts that you prefer. Experiment to come up with a mix that you love! Pine nuts, walnuts, pistachios, cashews, and almonds all offer some delicious health benefits. Try one nut or make your own unique blend. This high-energy snack goes well with dip or just as a stand-alone snack! Try with peanut butter for some extra nutty goodness! 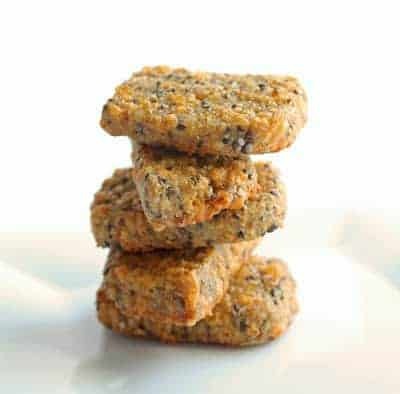 I’m sure you have figured out by now that a low-carb cracker recipe can be a great way to hide some nutritious foods that you or your family may not get enough of. This is another great example of this! Spinach is one of the most nutrient rich vegetables available. It has the power to cleanse the liver and rejuvenate the body. 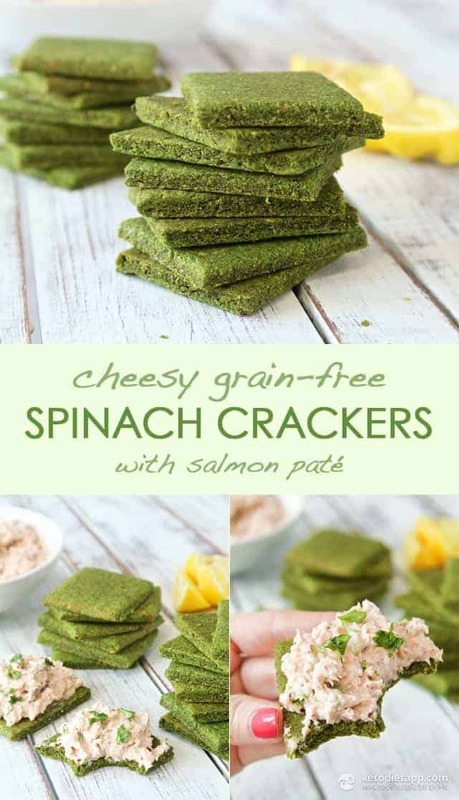 Sneak in some extra spinach along with some fiber in this delicious cracker! These are perfect to give to kids as well thanks to the delicious flavor and fun green color. Many of us lead an active lifestyle. Between regular workouts, jobs, and day-to-day activities, sometimes there is not much energy left at the end of the day. That is where this low-carb cracker recipe can benefit you the most! This cracker acts almost like a trail mix for the busy worker. However, where trail mix has a lot of carbs, this mixture is low-carb and delicious! Take them along for a snack that will pick you up during that sluggish time! Mix up the seeds and try a few different spices to make the recipe your own. 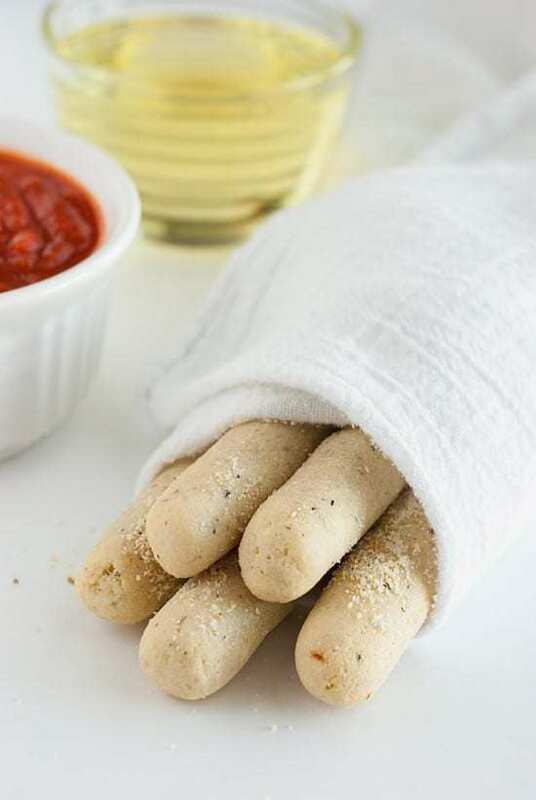 You can’t have pizza without breadsticks! But now you can have breadsticks without all of the carbs! These delicious flavor sticks can be made in as many flavors as Pizza Hut! Try the recipe variations of cheese, Italian style, or cinnamon sugar! These also make a great snack to take along to the ball game so when everyone else is eating their pretzels and nachos, you can munch away on these! Try with cheese dip for extra flavor. 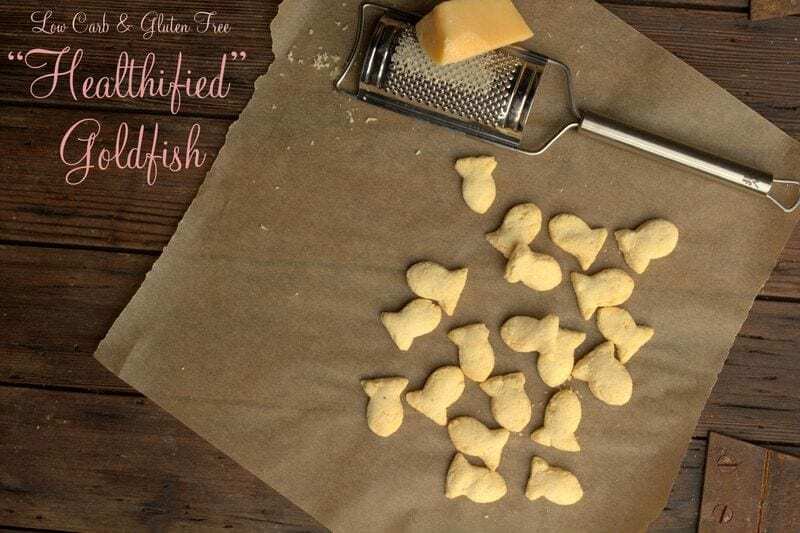 Goldfish crackers were a part of many of our childhoods. Unfortunately, we don’t have the metabolisms that we did back then and goldfish may be off limits now. 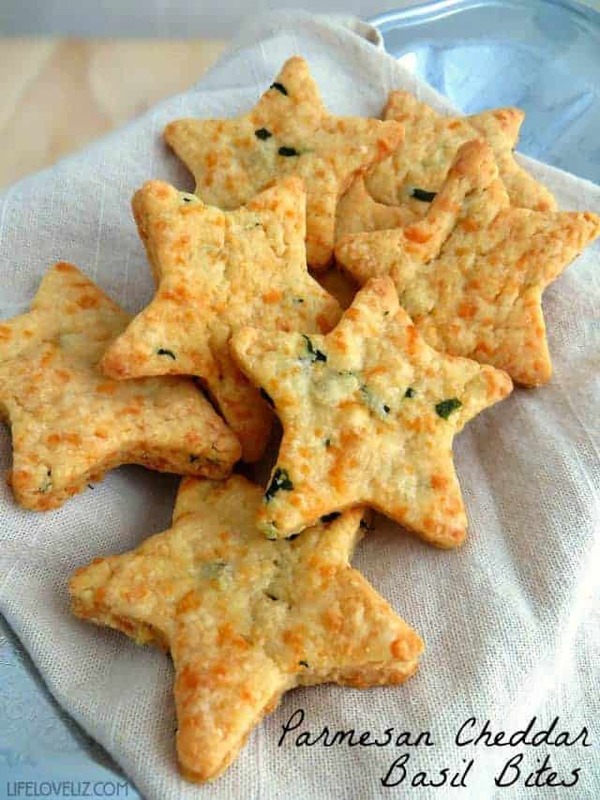 These low-carb crackers allow you to relive a portion of that childhood! With nothing more than cheddar cheese, almond flour, and sea salt, this recipe will bring back memories and excite taste buds! Although this is not one of the carb-free cracker recipes, it is definitely a worthy mention. To add a bit of bite to a cracker, a pepper is the perfect go-to ingredient! Add in cheese and you get a cracker that is hard to turn down! This cracker is wonderful with any cream cheese based dip. Also try with cheddar or spicy cheddar dip to add fun to your diet! Keep a bag of these handy when ever you need a little crunch and a little spice. 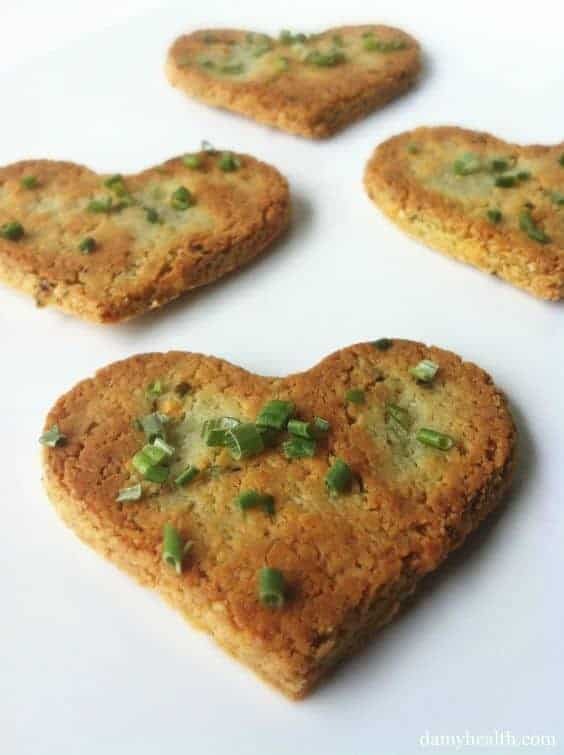 This versatile snack can be made either into low-carb crackers or to bites! With an extra hint of basil, this recipe is good to take to parties or pot-luck luncheons! Added half-and-half makes the bites a bit more flavorful and creamy! With wonderful texture and rich flavor, guests and family members will certainly beg you to make these again! Try serving with a hot beer cheese for an extra kick! Spinach dip would be a great option as well. See Also: Easy to Make Blackberry pancake. Sesame seeds are another great source of those “good” fats! Sometimes we need a cracker that is a little bit more wholesome. On those occasions, this is a wonderful option! In addition to nutritious, this cracker also has a nice crispy texture to make your mouth happy! Since the flavor is not super complex, this is a cracker that would go well with just about anything- think of adding a few spices and herbs to your mix! Try with cheese, vegetables, or fruit to add more flavor! The key word for this cracker is fiber! It is hard to lose weight without fiber, and it is hard to get enough fiber without eating grains. Flax and Chia seeds are a wonderful way to get high sources of fiber without all of the unnecessary carbohydrates. And these crackers have twice as much fiber as a granola bar! 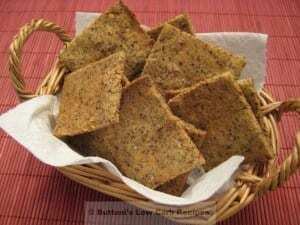 Though flax seed and Chai seed are not so tasty on their own, they are perfect baked into a cracker! Try eating on the go, share with guests, or have with a meal! A low-carb lifestyle can lead to many health benefits. More nutrition, better awareness of the quality of food you eat, and weight loss are all perks of life with fewer carbs. Your body actually processes carbohydrates as sugar, so a decrease in carbs is similar in some ways to cutting out candy and sugary drinks. That has to be good for you, right?Additionally, you’ll find that your energy level increase exponentially! All of this sounds like the perfect reason to start a low carb diet. For many, the experience can be frustrating at first. Having to give up favorite treats can be hard. However, replacements to food like crackers and breadsticks help you maintain the confident lifestyle and body that you deserve while being able to eat what you really enjoy! 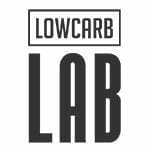 Give the low-carb lifestyle a try! You know what they say! Once you go low-carb, you’ll never go back!